Materials innovation for a better tomorrow. 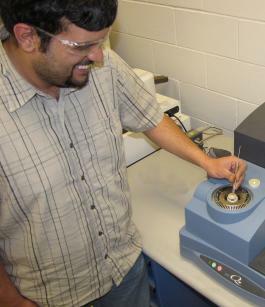 The Materials Innovation Service, located in the Department of Industrial Technology at the University of Northern Iowa, is a joint program between the Recycling and Reuse Technology Transfer Center, and the UNI Metal Casting Center. The UNI Metal Casting Center is a nationally recognized leader in foundry research, applied technology, and technical business assistance. Through MIS, Iowa companies that are replacing mainstream materials with recycled material receive affordable materials testing and consultation. MIS also provides technical assistance to manufacturers wishing to re-engineer or re-tool their operations to include recycled content, and in the development of innovative recycling/reuse process technologies that help turn waste into resources. Testing services include chemical, mechanical, and physical property tests for a wide range of materials. MIS also acts as a consulting resource, tailoring its testing services to each client's particular needs and assisting clients in product development and process improvement. In addition, MIS has the ability to custom build testing equipment for specialized applications. It is the mission of the Materials Innovation Service (MIS) is to provide low-cost, reliable consulting services for small to medium sized Iowa manufacturing companies with regards to product development and materials innovation. MIS is an organization with the goal to connect the resources of the University of Northern Iowa with Iowa manufacturing companies, to increase the use of recycled materials and reduce the amount of waste generated within these companies’ manufacturing processes. It is the vision of the Materials Innovation Service (MIS) to become the preferred resource for Iowa manufacturing companies with regards to product development and materials innovation. MIS works to ensure that all manufacturing companies in Iowa are utilizing recycled materials in their products, thus helping to reduce wasteful manufacturing practices and protect the environment.